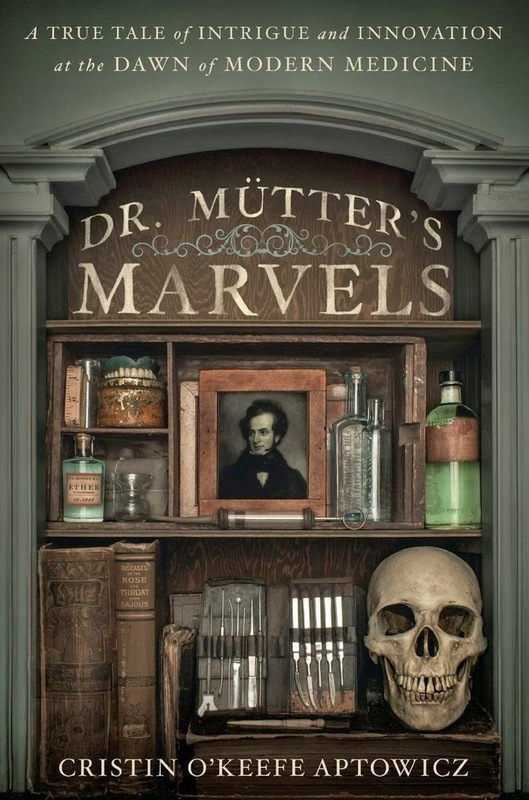 This Wednesday, September 10th, The Morbid Anatomy Museum will be hosting author Cristin O’Keefe Aptowitz for a talk based on her new book Dr. Mütter’s Marvels: A True Tale of Intrigue and Innovation at the Dawn of Modern Medicine. Rebecca Rego Barry--editor of Fine Books and Collections magazine and a collector of nineteenth-century surgical books--has just written a fascinating and informative review of the the book, which follows below. You can find out more about Rebecca here. Hope very much to see you at the lecture with the author on Wednesday night, where copies of the book will be available for sale and signing! More on that here. Gory medical scenes in director Steven Soderbergh’s brainchild, "The Knick," will make viewers squirm. The new Cinemax series, which debuted on August 8, is certainly not for the squeamish (it airs on Friday nights). Five minutes into the first episode, we’re already watching a surgeon slice into an anesthetized pregnant woman in his twelfth unsuccessful—and deadly—attempt at a C-section. And yet, the show’s bloodiness pales in comparison to the torture described in a fascinating new book by Cristin O’Keefe Aptowitz, Dr. Mütter’s Marvels: A True Tale of Intrigue and Innovation at the Dawn of Modern Medicine (Gotham Books, Sept., $27.50). The difference? Ether. "The Knick" is set in a fictional version of the real Knickerbocker Hospital in New York City in 1900, a relatively modern age for medicine. By then, at least, doctors understood that cleanliness, particularly sterilized hands and tools, could seriously diminish the spread of infection. They also had the ability to chemically induce sleep in patients who needed surgical treatment. Not so the physicians in Dr. Thomas Dent Mütter’s time, only sixty years earlier. When he cut into a patient, she felt every incision. During one of the surgeries chronicled by Aptowitz, Mütter removes a chunk of skin from the neck of a 28-year-old woman, who, having been badly burned at the age of 5, was considered a “monster.” With one attendant to restrain her, Mütter took his scalpel to her neck “deep enough to get through the heavy scar tissue, but light enough to, hopefully, avoid the delicate muscles of the neck and the heavily trafficked arteries and veins.” And after he had finished with that, the second stage of the surgery commenced. “The woman tried to stifle her cry as Mütter carved out a piece of skin from her back—six and half inches in length, by six in width, slightly larger but the same shape as the wound on the front of her neck.” He had created a “flap,” which was then lifted over her shoulder and stitched onto her damaged neck—all of that, without so much as a drop of nitrous oxide (they prescribed mouthfuls of wine, as needed). He then starved her for almost a week, which was considered ‘best practices,’ and she lived. That’s why Mütter and his colleagues, even the obtuse ones who refused to believe in contagion, seem quite heroic in Aptowitz’s engaging book. They sawed off entire limbs to the sound of blood-curdling screams, knowing full well that many on whom they labored would die anyway. Mütter, the handsome and well-dressed doctor with audacious ideas, was not exactly lost to history before Aptowitz picked up his trail, but interest in early medicine—and his Mütter Museum, which he founded with his own collection of anatomical specimens and oddities and $30,000 just before his early death at age 48—was certainly relegated to a small group of fans who like a little history with their blood and guts. Those of us who visit places like the The Morbid Anatomy Museum, watch shows like "The Knick," and read books like this one. I just finished Aptowitz's book, wish I could be there to hear her speak. Dr. Mutter had such an effect on his students and it wasn't the museum, I never knew that. The list of accomplishments of his students are amazing!